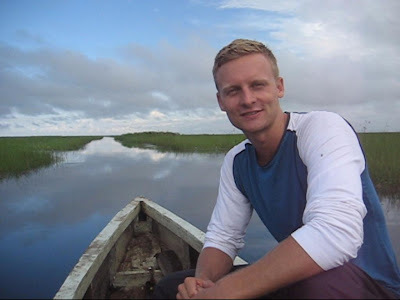 Living and learning on a 1 year volunteer placement with Engineers Without Borders Canada. 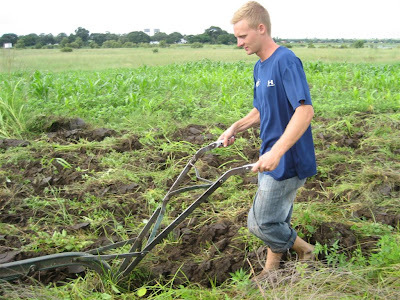 Yesterday after a hard morning's work plowing my field, I came home hungry to a house with no food. I hadn't planned well and did not stock pile for the week’s end. I rummaged high and low but all I could find were a few small pieces of cassava root which I optimistically roasted, hoping to end my hunger and rejuvenate my energy. I could always buy food, but it was Sunday and I didn't feel like making the long walk to the market (1hour) to buy rice or maize, so I decided to tough-it-out until evening and hope my roommate Monde would bring some fresh fish for dinner. I then sat under a tree, and with a few pesky but lovable kids poking at me for attention, tried to distract myself from hunger by reading. The previous weekend I had started Nelson Mandela's autobiography, and thus far I was enjoying it VERY much. After a few chapters and to my delight, my kind neighbour, Bo Nyambe, brought over a steaming bowl of 'something' – something that I had yet to encounter after 6 months in Zambia. The fact that she brought it over without me asking or knowing that I was without food, is typical of the generosity and kindness of the people in my village. Imagine living among those who are statistically the worlds worst-off in terms of access to health care, opportunities for education, and security of food, but here they are, quite regularly and selflessly sharing with me, a white, rich visitor from a distant land. The following graph of life expectancy vs. personal income was generated using Gapminder. I shoveled large spoonfuls of this new food into my mouth and then asked "kingi ki ye?" What is it? Bulgur wheat I was told, bulgur wheat from World Vision! WHHHAT - I almost spat my food out as I gasped in shock?! 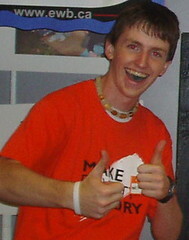 There I was, an Engineers Without Borders Volunteer, eating official World Vision relief food – ironic. While I hadn’t stood in line at the school waiting to hear my name called, I none the less had questions of ethics bouncing in my head. I couldn't help but laugh, but food aid and the need for it are far from funny issues. The reason boatloads of food aid have been chugging up the Zambezi River to Western Province is water. 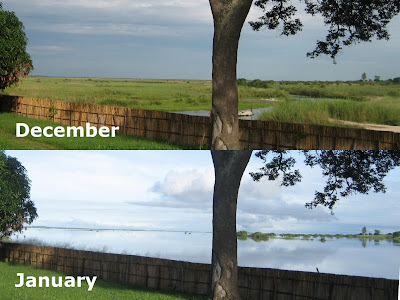 Not floods from too much local rain (the Government's Meteorological Report shows below average rain fall this season) but rather from floods caused by surging rivers fueled by rain that has fallen in the DRC and Angola. The river by my village has gone up 15 feet in two weeks – a foot a day! I had been warned of the floods, but never believed, as such a dramatic change is difficult to imagine. Anyhow, below average rain fall and extreme flooding are not a good combination. 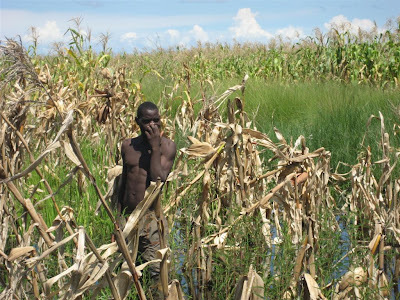 It means the maize has been stunted by water deprivation, and that before any harvest at all, the field can become completely inundated overnight. 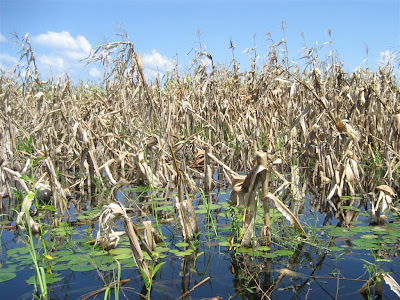 This sounds like a tall tale, but when I take my small canoe to work each day, I look down and see the tops of maize plants (7 feet tall), three feet under water! It's shocking. So what's the logical solution to this problem? Food Aid, Food Aid, Rah Rah Rah! Well not really, but many an organisation and many a government believe so. Today roughly 20,000kgs of maize and bulgur wheat were sent up the river, and the same will follow tomorrow. Once it arrives in Kalabo, it is distributed through a fascinating ad-hoc private sector delivery service, where anybody with a boat or an ox-cart can receive one 50kg bag as payment for transporting ten bags to distant villages. This quickly gets the food to the places hit hardest. Globally 4 million tonnes of food aid is distributed annually, with Canada contributing just under 10% and the US approximately 60% of it all. I believe though, that food aid is NOT the solution, and should not be considered official development assistance. I think of development as a process of lasting positive change and food aid does not qualify. In Zambia, I've seen it distort local markets, create dependency and completely glaze over the root causes of the problem. Food aid is self perpetuating; it makes people slow in finding their own solutions to their food security problems; food aid creates more food aid. The real solution is simple and is demonstrated well by my neighbour and good friend Bo Ndate Scana. Bo Ndate Scana, grows maize, rice, cassava, sorghum, millet and vegetables, he catches fish, gathers fruits, rears chickens and milks one cow – his livelihoods are certainly diversified. Between all of these different sources of food and income, he'll be fine through any particular weather disaster. If his maize floods, his rice will flourish, if his chickens die, the fish will bite, and under all conditions, the resilient and amazing cassava root will always bear good yields and feed his family well. When I first arrived in Zambia, I spent several weeks touring remote villages interviewing men and women and meeting with community groups. I was told by countless people that they were starving. It felt terrible to hear and I never knew how to respond. Four months later though, during my daily language lesson, I learned a funny fact. ‘Buhobe’ (the staple food) in the local language Losi, translates directly to ‘food’ in English. Since ‘starving’ is defined as having 'no food,' and ‘food’ is defined as ‘buhobe,’ then even if you have just finished a sizzling 12oz fillet-mignon with mashed potatoes and gravy, you could still technically be ‘starving’. I don’t believe this was a strategy of luring sympathy out of a relatively rich visitor, but instead it a case of mischievous linguistics through translation. But regardless many of the people I visited were certainly undernourished. I can't honestly claim to be unconditionally against food aid, but I would institute a policy in which every dollar invested in relief food must be matched by two dollars towards productive livelihood diversification training and agricultural extension work. I would then start gradually decreasing the amount of food aid that is distributed, and withhold it for only the most extreme disasters, and even then, I might institute a food for work program or something similar. Times certainly are the toughest I've seen in Kalabo so far. Crops are flooded, malaria is rampant from the standing water encouraging mosquito reproduction, cattle are dying of corridor disease, and my work has slowed to a sluggish pace due to the logistical difficulties of traveling to villages and organizing meetings with a wooden boat and rubber boots. I'm still smiling though, because I've learned how people survive and I have hope. People are lifted through problems by a great wave of family and community support. Many African cultures define family much more broadly than we in Canada. 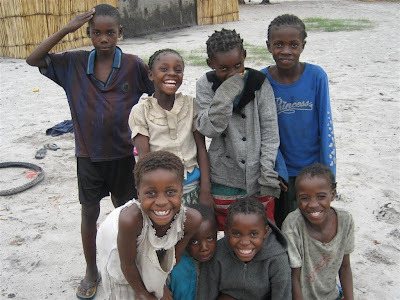 In Lozi, there is no word for “nephew or niece” to distinguish your sister’s children from your own, because there is no difference, her children are your children. I've seen this firsthand as I've been gradually welcomed into the loving family that constitutes my village of Sunga. This network of social capital provides true strength to rural communities. Today I read the last page of Nelson Mandela's “Long Walk to Freedom.” His struggle against Apartheid lasted his entire lifetime and left him innocently imprisoned for nearly 30 years. There is no doubt that this fight was difficult, tragic and trying, but I couldn't help but think how much simpler his battle was then ours. Apartheid was well defined and legislated. Someone was clearly responsible and the oppressed were united by commonalities. The battle that we face today, the end of extreme poverty is none of these. Poverty is not a legislated Act, it's a condition of life for many of the Southern majority perpetuated structurally and personally. It is complex, ill-defined, under-perceived, dispersed and multi-caused. I’ve always found the concept of an outsider fighting for the liberation of others a bit questionable. Can you and I genuinely contribute to ending extreme poverty? Do we accurately understand? Can we truly empathize? And will we fully commit? On the last page of Mandela’s book I found encouragement. I thank you for your support on my short assignment and congratulate you as part of this much longer struggle. Hey bro! Love the stories, and hearing of the work that you're doing. Am proud to know you, and pretty glad you didn't break your neck doing a handstand off the top deck of a houseboat this summer! I've been reading some of Geldof's speeches and articles lately - and not surprisingly, he's in agreement with you on how to promote sustainable development in Africa. It seemed around the time of Live8 last year (which I was at - Pink Floyd was brilliant), he had really started to get that message across - it's not food matters, it's the skills to grow the food. I know this isn't something that requires a brain surgeon to figure out - but it is something that seems to fall on deaf ears in the political world. I guess shipping over food is easier - and accomplishes the "instant gratification" required among politicians. And now - only a year and half post-Live8, the promised funding, and commitment to DEVELOPMENT from the G8 leaders is dwindling, in wake of OIL WARS - Return of the Bush. Cheers from London. Will see you back in Canada soon. I've had reoccurring nightmares of that nearly fateful handstand... never again... well okay... probably again next trip - you in? "in wake of OIL WARS and Return of the Bush" - were certainly set back the momentum of Live8. That's cool that you were there, I'd like to have been, but regardless I think it did do quite a bit of good as far as building the "political will" for development. £1.1k per hour hey? 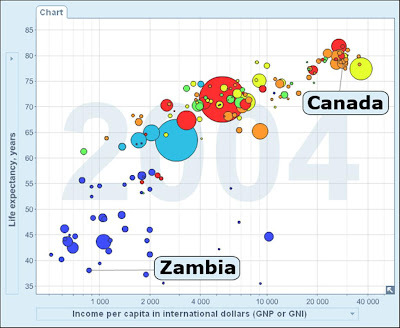 Maybe you can skim a bit off the top and invest in some Zambia businesses! Hey Chad, great to hear from you, your stories are always amazing and it allows a lowly accountant to live through you (hahaha). The pictures are always amazing, I can't beleive how much the water can rise in sucha short period. 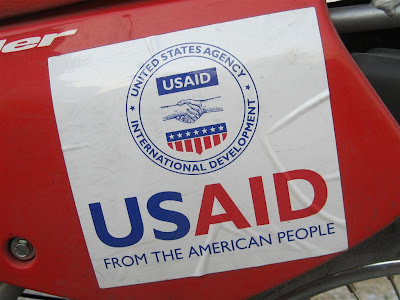 I am in agreement with your perspective on food aid (just like the old saying teach a man to fish ...) and it is quite pathetic that they have to advertise all over the packages that it is the USA that is helping these people, pretty sad. Anyways keep up the good work, we will miss you on the houseboat this year. Who will Keith have as his exploring buddy?. See ya Bro. Keep up the good work, dawg. I missed you at the conference this year... it's just not the same. However, I did go out with Ardell to a 25 cent draft night and drank roughly 40 beers in tribute to you. Oh and P.S. it's "recurring" not "reoccuring". I heard that Keith walked to Lake La Ronge in November and has been cutting logs with an Axe since... right now he's putting the final touches on a log cabin house boat, officially the biggest to hit Neilson beach... but still with no lights, leaving you as creepy as ever. 25cent drafts - oh the days. I've had 'recurring' dreams of those as well. Great blog man. the name is Cesar. I mert your wonderful parents in Isla Mujeres, Mexico. they are so proud of you. Dude, i so completely admire what you are oing. Your generosity in love, life, and the spirit of giving is what we need more in this world. Bookmarked your blog space.your work is inspirational. Pardon the typing and spelling. Typed so fast did not edit. Wait a minute. I forgot to tell you that I am from the Philippines. Your parents told me that you had spent time in my Islands (which one and where)? 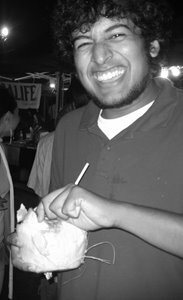 I grew up in the states and found great refuge working with a not-for-profit Fil-Am theatre company in Chicago called Pintig. we deal with issues with all the "ISMS" that un unjust society provides. cheers. Hope all is well. It looks and sounds great.. I still have problems to get used to the "normal" live here in utrecht... people from here make me stresfull!!! aaaaagh I mis the peacefull live of Kalabo!! Enjoy it to the upmost!! I think of it every day!!! Heard about your blog from Jason and Erin. I loved your last posting, and am in full agreement about the counter productivity of food aid!!! We do some food distributions for WFP in the same villages as some of our other food security programs, and I think it totally wrecks participation in other projects, as people know that CPAR will be distributing food at the end of the month. It drives me nuts. The sad reality is that food aid becomes the "bread and butter" for different organizations, (i.e. they get paid per ton of food to move, and always have surplus cash at the end of the distribution which they are entitled to keep, so in essence it becomes fundraising for themselves grrr.) so most organizations will continue distributing for WFP whether they believe it is sustainable or not. Just another reality of the "aid business". Great to meet you in Moz, and look us up next time you are in Malawi! Dude, your work is amazing! im glad that i've met you here in Dagupan City, Philippines. it was crazy though that we had just a little time to talk, anyways take care always bro and i will leave you this quote " When You are in the Service of your fellow Being You are in the Service of Your God". I just thought about giving unselfish service can actually glorify God above and we always have to remember that true service is not that something we expect in return. As a Zambian living in Ithaca pretty close to the Canadian Border with the US, I must say I am totally awed at what you're doing in Kalabo. My wife is from there. You 've given me the courage to get involved in scary missions like yours and I truly appreciate your strength and love that you have for the humanity at large. A great report on food aid. There is no better way to analyze such a topic of great controversy as when you yourself are on the receiving end. 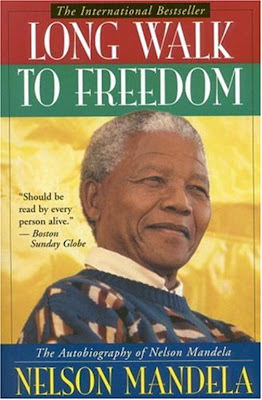 I read Long Walk to Freedom as well while in Ghana and I simply could not put it down. Inspirational page-turner. Pretend this comment says everything that Kyle's comment does. Except I read the book when I got back. Found your blog by mere chance and have been reading it with interest. I have lived and worked in Kalabo from 1993-1996 where I was attached to the district council to help them with district development plans and projects. I could not agree more with your views on food aid! In my time together with the department of Agriculture we resisted receiving tons of World Food Programme AID originating from Europe. Instead we managed to have a much smaller food intervention for handicapped and otherwise deprived people and did I organize a large cash for work programme employing some 2500 people (men and women) in infrastructural works including a navigable canal from the North-West to Kalabo town, a feeder road from Sihole to the flood plain and the first part of the "Kalangola" road from Kalabo town (near the Catholic Mission)along the floodplain to the village where also the Sihole road connects to the plain. From there we started an embankment in the direction of the pontoon (which has actually been built by one of my predecessors with grain silo's). On Google earth I see that the old embankment is still there but that now a new road has been developed. I'm not sure where you are actually located, is it somewhere along the Luanginga? I lived in Kalabo town on the so-called "river side" coming along the main road from the Catholic mission to the "Boma" it is a road on the left which follows the edge of the plain towards the water towers. I was living in the 3rd white house on the right (3 similar then council houses). Should you happen to have some pictures of Kalabo town it would be great seeing them. My name is Elisa Leyva-Guerrero. I am currently working for my PhD thesis on enhancing the protein content in cassava. 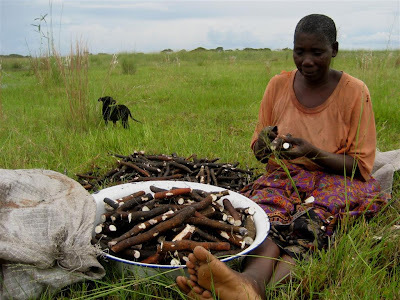 I was preparing my presentation for the American Society of Plant Biology meeting and I came across that awesome picture that you have of the girl cutting cassava. I put it in a part of the presentation where I show people eating or preparing cassava. I have of course given you full credit for the pic. Sorry I couldnt contact you before and asked you it was kind of a spur of the moment. Congrats for all you have been doing. visitors to date! Thanks for reading.